Theresa May’s Right Bedfellows: What Exactly Is the Democratic Unionist Party (DUP)? Following Theresa May’s loss of majority the Democratic Unionist Party, DUP, from Northern Ireland has suddenly come to international prominence. Who are they, what do they want, and what does their propping up of a UK government mean for that country and all the others who have to deal with it? Very few people in mainland UK could answer these questions. Everyone has a vague idea about Northern Ireland being divided into Protestant and Catholic, Loyalist and Republican, but few want to know any more because everyone of voting age has lived through The Troubles and their aftermath. For most people living in the UK Northern Ireland equals violence, terrorism, extremism and intractable political differences. But few nowadays want to think about Northern Ireland, because it is too complicated to understand and too unpleasant to try to understand. However now they are being forced to, as their futures are bound up with whether the DUP reaches an agreement with the Conservatives, and if so, what these Northern Ireland people will want in return from a country already long sick of them. It is impossible to summarise what the DUP are, and why they have come to prominence, in one article. But whatever you try and say, it doesn’t look good. The very existence of the DUP is an admission of failure on behalf of the British government and of humanity. May now finds a common language with a coalition with homophobic, racist, anti-abortion, and in simple language, “anti-women rights bigots” and that is just for starters. Bedfellows of convenience do make for a witches brew. For instance, when Jörg Haider turned the Austrian Freedom Party into a neo-fascist organisation and it became part of that country’s government the world said “how on earth did this happen?” Well it happened in Northern Ireland long ago, and many of its voters have little choice but to support it because no one else even vaguely speaks for them – not because the locals are extreme or bigoted, but because so many people have got so much wrong for so long that the emergence of the DUP is the natural consequence of an obscene record of failure. A quick recap: when the whole of Ireland was ruled by the British the ruling class were almost entirely Protestant and everyone else Catholic. The official religion of the UK as a whole had swung between Catholic and Protestant several times before the Church of England gained the upper hand. The English conquest of Ireland took place around the same time, but Ireland remained Catholic regardless, and was thus thought to be a backward region that needed to be civilized. As part of this civilizing process Protestants from Scotland and England were financed to take land in Ulster, provided they spoke English and only allowed other English-speaking Protestants to live and work on their land. This separate transplanted community saw itself as British, not Irish, and obviously sought to maintain the privileged position into which it had been put. We are going back to the early seventeenth century, but Northern Irish politics is still deeply bound up with events of that era and before. Very few of these Loyalists supported Irish Home Rule, which became a big issue in the nineteenth century. Both sides developed paramilitary forces to try and impose their opinion on the other, and both accused the British of being sympathetic to the other for not stopping such activity. This was the start of a long tradition of fighting violence with violence, which each side justified by saying that if the other side gave up murder, so would they. Home Rule for Ireland passed the UK parliament in 1914, over the armed objections of these “Ulster Unionists” as they became known. The First World War prevented Home Rule from being implemented, but the end result was an independent Irish Free State. When this was formed by an act of the UK parliament, the devolved Parliament of Northern Ireland was given the right to opt out of the new state if it asked the British monarch for permission to do so, which it did on the first day it could. This established the principle that Northern Ireland will remain in the UK for as long as the majority of its people want that. The new dominion of Northern Ireland remained part of the United Kingdom, but with certain local quirks designed to pacify the majority. Catholics were discriminated against in jobs and public housing, and the electoral system was rigged to produce eternal Protestant majorities even in majority Catholic areas. It had the same political parties as the rest of the UK, but with a local slant – the Labour Party was the Catholic party, while the “Conservative and Unionist Party” (which is what the UK Conservatives are still officially called) represented Protestants, although Labour Unionists also existed. Northern Ireland now has different parties because its own local parliament tried to address this discrimination. The more radical Protestants, led by the Rev. Ian Paisley and his very small Free Presbyterian Church, saw granting Catholics civil rights as a threat to their community’s supremacy, while the Catholics felt that only uniting with the Irish Republic would give them any guarantees. Both sides developed paramilitary groups to protect them from the other, and these groups came to be seen as terrorist. Consequently Irish politics split into independent, right-wing Unionist parties with local concerns, effectively divided by how far they supported paramilitary activity, and localised left-wing Catholic parties, such as the SDLP and Sinn Fein, which were divided in the same way. The DUP was the most radical of the Protestant parties. It was Ian Paisley’s creation, and emerged from another brainchild of his, the Protestant Unionist Party, whose name demonstrates where he saw mainstream Unionism heading. The DUP has long had a common membership with terrorist paramilitary groups. Paisley and many of his followers were arrested many times for public order offences concerning protests against Catholics, and against the authorities and police for defending Catholics. 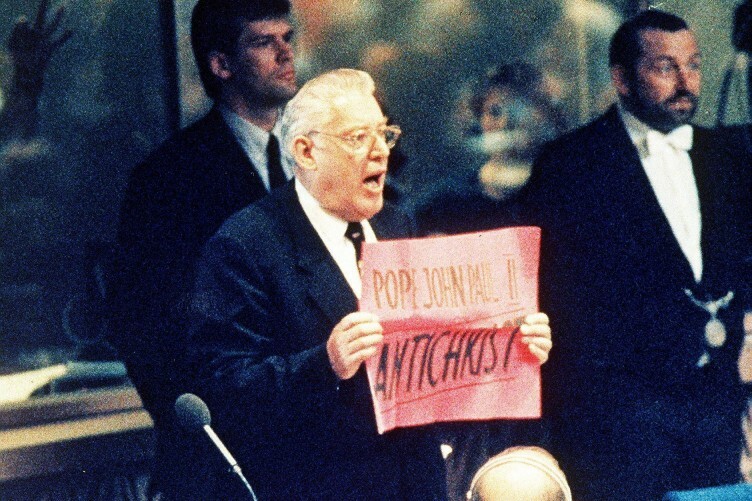 On one famous occasion Paisley, by this time both an MP and MEP, interrupted a speech Pope John Paul II was making to the European Parliament by shouting “You are the Antichrist” and was removed from the chamber with difficulty. During The Troubles it was the more moderate Ulster Unionist Party which dominated. As soon as peace was finally agreed Northern Ireland did not return to its previous, extension-of-the-UK political pattern. 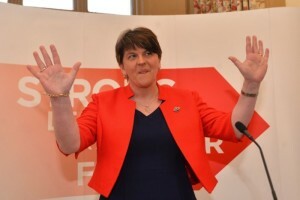 Instead the DUP, and its Catholic counterpart Sinn Fein, became the dominant parties within their respective communities. Now they weren’t killing each other, each community wanted the more radical parties to give them the strongest possible voice in the new, very separate, reality, such was the common alienation from what the British had done in Northern Ireland, whichever way that was seen. Now the DUP is dictating the future of the UK, and possibly Europe. We all deplore the fact that Al Capone ran the government of Chicago at one time. What sort of world are we living in when the UK government depends for its survival on the DUP? As you might expect, the DUP regards itself as “socially conservative”. It opposes abortion and homosexuality, promotes Creationism and denies climate change. Many Conservative MPs and members share these views. But on other questions the two parties are fundamentally opposed. The DUP is pro-Brexit but entirely against a hard border with the Republic of Ireland. As many Unionists cross that border daily for work or family reasons this is not surprising. But it is now in a position were it can demand the measures its supporters want most before agreeing to prop up Theresa. The Conservatives say they want a “hard Brexit” but have consistently refused to say exactly what that means. The DUP may well want an explicit, public guarantee on the border question, which Theresa is unlikely to give them, even behind closed doors. More importantly, the DUP is big on welfare. Unlike in the rest of the UK, it seems to regard the poor and elderly as an important constituency, and is determined to ensure that pensions rise, and a range of social services are provided for its often older, working class supporters. Theresa is happy to tell users of food banks that there is no “magic money tree”. This is not surprising, as for many years her party has had no social welfare dimension whatever: it says in effect that if the economy is right social welfare measures aren’t necessary. Theresa is no more likely to agree to welfare expansion, in the part of the UK which already receives more public money than any other, than she is to jump off Westminster Bridge. The DUP also staunchly defends traditions which have been the focus of endless problems. One of these is marches held by the Orange Order, and similar institutions which celebrate the Protestant supremacy. These annual marches through towns, and sometimes Catholic residential areas, with banners flying and pipes and drums playing are seen as triumphalist by the Catholic community, and many have been banned as a result. But they are seen as a fundamental expression of civil rights by the DUP, and banned marches will have to be reinstated for the DUP to convince its members that they are getting something out of a deal with the British government. No UK government would agree to these terms in other circumstances. During the election the Conservatives sought to capitalise on Jeremy Corbyn talking to the IRA during The Troubles, and probably did gain some votes by linking him with terrorists in this way. They will soon discover however that it is involvement with Northern Irish politics which turned the public off, not the spectre of terrorism, which people want to believe has vanished from the place they don’t want to think about. Despite all this, Theresa needs to cut a deal with the DUP to “govern in the national interest”, she says. First it was “Brexit means Brexit”, then it was “strong and stable”. What does “govern in the national interest” actually mean? Under the Good Friday Agreement which ended The Troubles, the UK and Irish governments act as “honest brokers” in Northern Ireland, both able to make suggestions about how the place should develop and mediate between the sides. They also agreed that they would be entirely impartial in Northern Ireland, and not align themselves with any one side against another. If the UK government reaches an agreement with the DUP, and not all Northern Ireland parties working together, to stay in power it is in breach of the peace accords. Is starting all the violence in Northern Ireland again “governing in the national interest”? Most of Northern Ireland’s politicians still have intractable positions. However they get on personally in most cases. The power-sharing executive set up after the peace agreement saw Ian Paisley installed as First Minister with Sinn Feiner Martin McGuinness as his deputy. Though diametrically opposed politically, the two men worked so well together they became known as “the Chuckle Brothers” for their obvious delight in each others’ company . If violence breaks out again after such a beginning to the peace era, it will be hard to blame “those bigots in Northern Ireland” as usual. Though there are those who might want to sacrifice peace, Theresa’s actions in calling the unnecessary UK election, and then talking to the DUP in defiance of the peace agreement, would be more responsible than anything else, and the world would know it. The electors of Northern Ireland have the right to vote for the DUP. Their opinion should be respected. But very few DUP voters would have ever wanted a situation to exist where this party was the nearest thing they had to an expression of their opinions. Only about 1% of Northern Ireland’s population were members of Ian Paisley’s church. Yet he exercised such huge influence on Northern Irish affairs that his followers, who were originally all obliged to belong to this church, have now become the local majority. After all Northern Ireland has seen, the DUP he founded, with 10 out of 650 seats in the UK parliament, is being given the chance to do the same to the whole UK it so vocally supports. The DUP was happy to help create this process. That’s who Theresa is happy to work with, at just the time she is trying to renegotiate the UK’s post-Brexit relations with the rest of the world. Most countries would consider this their worst nightmare, and here it is, in broad daylight, with this once-great superpower seemingly unable to do anything about it.